With this Expression you can move layers randomly away from the camera (or towards it) and simultaneously scale them such that from the perspective of the camera they look unchanged. This is useful, for example, if you have a bunch of text layers and want them to look as if they would all be in one plane in 3d space and would have the same size. But if you turn the camera, you notice that some of them are very close and small, whereas others are far away and much bigger. 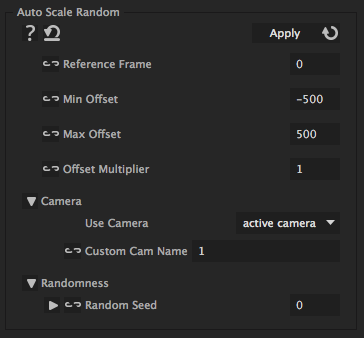 If you want to control for each layer exactly how much it is shifted, you can use the "Auto Scale" expression instead. The frame at which the layers should look as if their position has not been shiftet at all. For a value of 20, each layer moves 20 times as far as determined by "Min Offset" and "Max Offset", for 0 all layers are on their original position. Animate this value to move the layers further away or back to their original position. Name of the camera that should be used when 'Use Camera' is set to 'custom'. Change this number arbitrarily to get another random shift of the layers. For each number a different random value is generated.